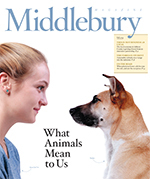 I’m very happy to announce that Will Poole’s Island appears as an Editors’ Pick in the Fall 2014 edition of the award-winning Middlebury Magazine. As a Middlebury alumnus and soon-to-be Middlebury parent, this is a particular honor. Congrats Tim! That is quite an honor. Thanks Kate! Hope to meet you at NESCBWI in April . . .
You are currently reading Will Poole’s Island is a Middlebury Magazine Editors’ Pick at Tim Weed.